Last February I posted this article about the space elevator, entitled The stairway to heaven is already a mile high. Now I learn that the elevator passengers might be fried to a crisp by the time they arrive at their destination. People talking loudly on their cell phones while you're trapped in an elevator with them is bad enough, but reaching the top floor well-done is something else! Space elevators are touted as a novel and cheap way to get cargo, and possibly people, into space one day. So far, they have barely left the drawing board, but ultimately robots could climb a cable stretching 100,000 kilometres from Earth's surface into space. But there is a hitch: humans might not survive thanks to the whopping dose of ionising radiation they would receive travelling through the core of the Van Allen radiation belts around Earth. These are two concentric rings of charged particles trapped by Earth's magnetic fields. "They would die on the way through the radiation belts if they were unshielded," says Anders Jorgensen, author of a new study on the subject and a technical staff member at Los Alamos National Laboratory, New Mexico, US. 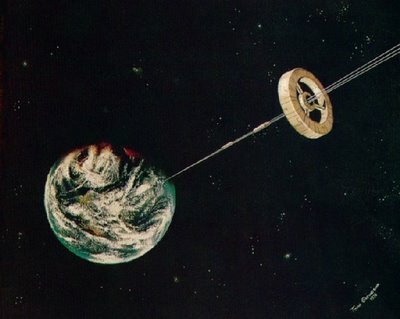 Space elevators had been planned to be anchored on an ocean platform near the equator, with the other end tied to a counterweight in space. At the equator, the most dangerous part of the radiation belts extends from about 1000 to 20,000 kilometres in altitude. The region did not hurt the Apollo astronauts in the 1960s and 1970s because their rockets delivered them swiftly through it. For a space elevator travelling at the current proposed speed of 200 kilometres per hour, however, passengers might spend half a week in the belts. That would hit them with 200 times the radiation experienced by the Apollo astronauts. There are several possibilities for dealing with the radiation – all of which come with drawbacks. One option would be to move the elevator off the equator. By shifting the elevator north or south, the most intense part of the radiation belts could be avoided. "Basically what we found was that by moving off the equator by the largest amount you can, you reduce the radiation by a small factor – but probably not enough," says study co-author Blaise Gassend of MIT in the US. In addition, if the elevator was located at a latitude of 45° north, roughly the same latitude as MIT, the cable would veer south, pulled towards the equator by centrifugal forces. So it would run nearly horizontally through Earth's atmosphere for thousands of kilometres, putting weather-related stresses on the cable that could weaken it. Another option would be to have some sort of radiation shield stationed along the cable so the elevator could pick it up when it is about to reach the belts. But such a shield would weigh down the whole apparatus, disrupting the natural motion of the cable. "Most of us are agreeing we don't want permanent weights on the ribbon," says Michael Laine, founder of LiftPort Group, a space elevator company in Bremerton, Washington, US. "It starts dampening out the ribbon's motion in ways we don't think we want." Generating magnetic fields around the climber could shield the habitat module from the radiation as it climbs through space. But it may be difficult to beam enough power to the climber to generate such a shield. Finally, space elevator builders could simply increase the overall mass of the elevator "car", or lifter – which will require more energy to heave it into space. LiftPort Group, which plans to take up as many as 20 people per trip, will pursue this strategy with a 100-tonne lifter. That is significantly heavier than the 20-tonne lifter planned by Brad Edwards, who devised the current conception of a space elevator. "I'm confident that we can solve it," Jorgensen says of the radiation problem, "but it's going to make things a little more complicated and a little more expensive." Let us now praise phytoplankton! Can you hear the Northern Lights?